Traditional 50th Anniversary Gifts of solid gold jewelry to celebrate fifty years of marriage! Gold is the traditional gift to celebrate a 50th Wedding Anniversary. Give your wife an original 18k gold pendant for this impressive milestone! The Traditional Anniversary Gift List and Modern Gift List both suggest gold for a 50th anniversary. A rare and expensive material, its association with true value is clear. From gold bars to coins to wedding rings, it has both a symbolic and very real association with value and permanence. Gold has been known for its beauty for thousands of years. 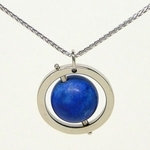 Part of the allure of this material for jewelry designers and other artists, is its workability. It can be formed into amazingly thin gold leaf, to cover the dome of a cathedral. Or it can hammered and shaped into a perfectly proportioned ring or intricate pendant, which can be worn for years without tarnishing. * For the children and loved ones wanting to celebrate this milestone, here are some thoughts: Have a party to celeblate the 50th anniversary couple...their achievement of sharing for over a half century is truly amazing. Before purchasing any gifts for the 50th anniversary couple, consider the anniversary couple's age and lifestyle. The greatest gift is the time they have been allowed to share. Make their anniversary day memorable by sharing your time, as well. 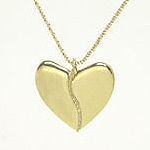 Sure, you can purchase gold items for the occasion, and we have some lovely gold jewelry to browse through. But we genuinely suggest that material things aren't needed to truly celebrate a 50th anniversary.